At the Delaware Audubon annual meeting on December 7th (A nice event, by the way), I had the chance to offer a few thoughts on Delaware, sea level rise, and climate change. Here is an expanded version of those comments. First, the reality is that climate-changing emissions keep rising and, while humans could act to stop this, we aren' doing so. See, for example "CO2 emissions rises mean dangerous climate change now almost certain." As many of you know, I've recently spent time in Minnesota. Minnesota (mean elevation 1200 ft, lowest point, 601 feet) is suffering from climate change and will suffer more. Floods, droughts, destructive storms, new insect infestations, shifting growing seasons, new public health issues, etc., are happening. But Minnesota will still exist-the state isn't going to disappear. We can't say that about Delaware (mean elevation 60 feet, much at sea level). Delaware is in fact the lowest-lying US state, with Florida and Louisiana being next at 100 feet. (data here). 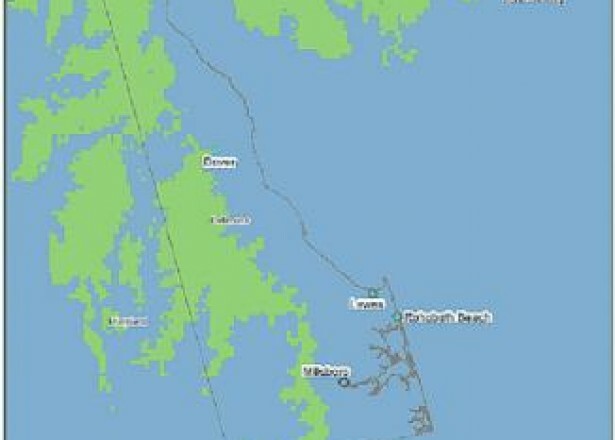 Much of Delaware is going to disappear under the waves. Delaware Audubon has done a nice job of pushing federal land managers to do a better job at the Prime Hook National Wildlife Refuge. From the Delaware Audubon website: "... the Delaware Audubon position called for working with inland farmers and land owners to acquire additional property for moving the refuge westward in the long term, including the possible creation of new freshwater impoundments that will strategically survive long enough to justify their creation, subject to long term sea level rise and subsidence projections." The gist of Audubon's comments apply not only to Prime Hook but to the entire state of Delaware. However, we aren't going to be able to move the whole state. Those Maryland counties to our West aren't likely to cede their ground to Delaware, and even if they were, the waters are advancing on them also from the other direction-Chesapeake Bay. We all know our land has been sinking and the waters rising. In Delaware, in the past century or so, these two things have been taken as amounting to a fraction of an inch per year of water rise, around a foot per century. Most of us know that climate change is speeding this up. This speedup has often been forecast to amount to a few inches over decades. But the effects of climate change are persistently underestimated by "official" sources such as the Intergovernmental Panel on Climate Change (IPCC). This is not due so much to incompetence as to policies of including only very-well-demonstrated effects. But there are very many things happening outside the official forecasts, such as the melting of the Greenland ice cap. This alone could increase sea levels by 24 feet, and it's melting faster and faster. Similar melting of Antarctic ice threatens even greater rise. Another general type of problem is that we tend to project gradual developments over long periods of time. But in the climate change pot is bubbling much potential for sudden transitions, discontinuous events, tipping points, flipped switches.. For more on this see: Special Report: IPCC, assessing climate risk, consistently underestimates . "We have very high confidence (>9 in 10 chance) that global mean sea level will rise at least 0.2 meters (8 inches) and no more than 2.0 meters (6.6 feet) by 2100." "... The Highest Scenario should be considered in situations where there is little tolerance for risk (e.g.new infrastructure with a long anticipated life cycle such as a power plant)." Many people, reading this report, might conclude as I do that it's likely to also be an underestimate. One source says Delaware has 1522 miles of shoreline. Maybe we could dike the state and install lots of pumps, like New Orleans? Who would pay for it? Maybe rounding off a few corners could save a few bucks. New Castle 100 ft (the Northwest part of NCC is above the "fall line" and geographically distinct. Mapping the details of "inundation," considering the effects of storms, tides, topography, and possible protective measures, is complicated. Most maps are simplifications, and many of the simplifications tend to minimize the threat. NOAA has just released a similar map. It doesn't zoom in quite as closely, but goes up to six feet. Note that ultimately, if the major ice sheets melt, only the far Northwestern part of Delaware, above the fall line, is above water. Part of the reluctance is that public officials don't want to get too far "ahead of the curve" or make problems seem insoluble. In April, 1996 I wrote an opinion piece, published in the Delaware State News, arguing ".low-lying coastal areas like ours are especially vulnerable to sea level rise caused by global warming. From this point of view DEC [Delaware Electric Cooperative] -and the rest of Delaware-ought to be providing some leadership .."
Sixteen years later, how are we doing? I suppose the picture is mixed. In recent years Green Delaware has been at odds with DEC's involvement in trying to build a new coal burner in Virginia-now most likely not happening. On the other hand, the Coop has increased it's investment in energy conservation programs. Delmarva Power seems to be going the other way: its current "Resource Plan" proposal contains shamefully little energy efficiency. Several years ago Delaware had a good program to encourage rooftop solar installations, but funding for this program apparently hasn't been maintained. The Bloom Energy scheme, wherein a fossil fuel burner was subsidized by Delmarva Power ratepayers in the guise of "renewable energy," is scandalous. A disturbing proposal coming from the Markell administration-indeed, DNREC itself!-calls for unwise floodplain development at Fort Dupont, near Delaware City. Closing note: The end of 2012 approaches, holidays are upcoming, many, many orgs beg for money at this time. We are wrestling with the question of what level of activity Green Delaware should maintain, whether there is support for us, what we should focus on. Please share your thoughts..